The Kraus sink compares favorably in materials and workmanship to sinks costing more than twice as much. Important installation note: the 30 inch sink must be installed in a 33 inch cabinet, and lateral supports must be added on the sides of the cabinet to support the weight of the sink. Not hard, but not to be overlooked either. The sink should be cleaned with a non-abrasive cleaner. Bartender's Friend is a good choice. Over time, the "feet" of the protective rack in the bottom of the sink will leave small smudge marks. But it's a small price to pay to protect the sink from damage from pots and pans. We purchased this sink about two years ago and I was so impressed with the quality and look when it was installed. However, as a homeowner (and dishwasher!) I would want to point out two issues to those considering purchasing this sink. First, the remnants from the dirty dishes do not get washed easily from this particular sink, as the base is very even and care needs to be taken to wash all food particles from the four corners. Second, several spots on the sink started to show signs of wear (dark roundish discoloration) that would not come off with stainless steel cleaner or any other product I tried. That being said, I received a lot of compliments on the look of this sink, and in general I was quite pleased with it. When we were in the process of planning our remodeled kitchen I fell in love with these farmhouse style sinks. I went to a few plumbing supply showrooms for pricing. Everything I liked was $1500 or more!! I decided to check here on Overstock and came across this sink. We were limited in size and this was one of the only ones that was going to fit.So we ordered it...and were so very surprised at how LARGE it is. It is such a beautiful sink and has become a showpiece in the kitchen. I have cream color cabinets and black appliances...so the stainless was a concern as well. Surprisingly....it looks awesome. The colors all blend very well.There is a grid that can be purchased for this sink. Unfortunately it isn't offered here on Overstock yet. But I HIGHLY recommend purchasing it to help maintain the beauty of your sink.I only gave Overstock a 4 out of 5 for value as I had to purchase the grid elsewhere. I hope they offer the grid here soon.All in all....a GREAT sink and another wonderful Overstock purchase. I waited to write a review until after I had plenty of time to use it. I purchased this as I was redoing my kitchen. I had refinished the cabinets and was going to put in new granite countertops. I had to do some alterations of the counter as it is deeper than most counters but the tradeoff is well worth the time. I purchased the 30 in. single basin sink and it works great with cleaning. I am able to lay my bar pan stoneware fully down in the sink and also I am able to soak my trays for the dehydrator. The single drain is nice as I have a garbage disposal hooked up to it and having just one drain cuts potential leak issues in ½. The insulation that is put on the sink cuts the noise down greatly I have a low noise garbage disposal and on my old cheap sink it was quiet but on this sink it cuts the noise down even more. And you dont get the loud ting sound that you normally get from cheap stainless steel sinks. The farmhouse SS front makes a bold statement and looks very nice in any kitchen that has other SS appliances. This is the first Kraus item I have ever purchased. It will not be the last as I have been very impressed with the workmanship and quality of it. I have recommended this item to several friends I know one purchased it and they also love it. When I have friends come over the sink is the first thing people notice when they enter my kitchen. At first people are kind of setback and not sure of it. Then when they use the sink and see how deep it is and what you can fit into it they are sold on it. I purchased this as a combo with the Kraus Commercial Pre-rinse Chrome Kitchen Faucet. Works great with this sink helps when rinsing out the sink. Very nice farmhouse stainless sink. It comes with a strainer and stainless grate that holds pans and dishes off the bottom of the sink. The strainer seemed a little light weight but it's not a concern for us since we connected a Waste King disposal (awesome as well) up to the sink and didn't use the included strainer. The bottom slope of the sink is very slightly pitched so the larger food particles don't always flow to the drain without some rinsing assistance. The inlcuded grate is great for keeping the pots from sitting on the bottom of the sink. However, be mindful that heavy pots and pans can bend this grate a little. And the feet supporting the grate do leave an impression on the sink bottom that need to be scrubbed from time to time. Have had this sink installed for about six months and have not had any issues with it at all. My wife loves the farmhouse look of the front of the sink and also loves the deep wide space it allows for cleaning larger cookware. Very nice sink and highly recommended. Great sink & we love it so far. We've only been using it for about 3 weeks, so can't comment on how it will hold up, but so far, so good. Part of our decision to go with a farm sink was that we are expecting our first baby next month so bath time in the sink would be much easier & it's extra spacious for large pans/pots as well. The quality seems very good & our plumber said it was much better than the ceramic farm sinks he often sees. The reason for 4 stars vs 5 was the install was more complicated than expected. Farm sinks have to be installed prior to granite, so the granite can be templated around them(learned this). Our granite installer didn't use the template as it shows the counters not overhanging the sink, which we wanted them to hang over the sink about an 1/8 or 1/4" so that food wouldn't get stuck along the seam & instead brushes right into the sink. The sink required extra support at the back as it's much heavier than a standard sink, which wouldn't have been an issue, except the metal/steal underneath extends farther, so when the plumber went to install the faucet the standard hole (I believe 1.5" from sink) was still too close to the steel that is underneath the cabinet, so faucet wouldn't fit. We had to have granite guy come back and move the hole back (also making it larger- luckily our faucet had a large base or this would have been an issue), so that the faucet could get past the steel underneath. This also meant cutting out some of the bracing below & moving those supports. This seemed to surprise both our plumber & granite contractor, so I think this is something that may be unique to this sink (not sure), but something to be aware of for install. Besides that hiccup, it's great!! We also like the grate that came with it that fits in the bottom. Makes hand washing items much easier as they aren't sitting in dirty water - just a small bonus! Overall very happy with this sink so far. Love my Kraus Stainless Steel Sink. Love the size, the high quality stainless steel and quality construction. I would highly recommend this Kraus sink to family and friends. Remodeled the kitchen: used this sink with the Kraus faucet and Kraus soap despencer: amazing! So beautiful, deep deep sink with bottom grid insert and adorable little drain "basket". (grid keeps anything from sitting on the bottom of the sink. I use Bartenders Friend to clean it...everybody that see's it wants it! I can set a 52 qt stock pan in it and still have room for more! Finally had my new sink installed and we love it. My husband had to modify our sink base cabinet and raise our drain for the dishwasher and garbage disposer but it worked out fine . Sink is deep. Almost too deep I'm 5'3" and while washing dishes I feel like I'm bending over too much. My back actually hurt a little. But I still love it. it's a beautiful sink. Love the bottom rack also. It really protects the bottom of the sink. No scratches yet. Can't beat the price. No problem with draining or cleaning out the sink as mentioned in other reviews. We just use the pullout spray. No spotting either. Though we are the types that wipe down and dry our sinks and counters every night. So happy with this sink! We recently expanded our home with a large kitchen and 2nd floor addition. I had my heart set on a farmhouse / apron style sink for years and this fits the bill perfectly!! The sink came well packaged in a wooden crate 2 days after I placed my order. My cabinet maker took the spec sheet included and customized the base cabinet easily with little extra cost. We are not handy so I do not know how easy it would be for some in our shoes to do themselves. My ONLY caution would be to remember that it is a fairly deep sink. I am 5'5 and have to bend over to scrub pots and pans with the sink set at a standard counter height. I am sure there is a work around for that but.. keep that in mind to save your back. My 3 year old daughter can still fit (with room to spare) for an old fashion bath while mommy is cooking dinner. All in all I would definitely recommend this sink and Overstock.com to anyone who is looking for a sink that WOWS people at a great price!! Thanks!! If you have been looking for a beautiful farmhouse sink to WOW your kitchen, this is it. The price is amazing for the quality. Came in wooden crate (earlier than promised which was great). Eventhough crate was slightly damaged, sink was fine. Install was a little difficult but not due to the sink. Our cabinet maker told us 30" sink would fit 30" cabinet. We needed to retro-fit so the sink didn't look too big for the cabinet but now, everyone comments on how great it looks. We have bisque colored solid-maple cabinets with granite countertops and the sink is what everyone comments on. The rack, sink stopper, drain-basket may seem like simple items but reallly make it a great value. My concern was draining, but the contours help with that, just use sprayer in corners and water follows the contours. All in all, if you are sitting on the fence with this purchase, don't worry, buy it, you won't be sorry. Ordering this sink was easy and true to what is shown. We loved the grate at the bottom and that it came with all the drain hardware. I was surprised that we keep the grate in the bottom but it doesn't not look as industrial as I thought. This sink really pulls our kitchen together. As with any stainless steel product, just make sure you wipe it down or else you could have waterspots that could turn into rust eventually. This is mostly on the apron part. The sink is high quality and looks fantastic. I definetly recommend a faucet with a pull down sprayer--this sink is deep! The Kraus 30" stainless steel sink was one of the best investments I have purchased for my kitchen. The quality of the product is worth buying its durable, and the stainless steel is strong. This sink will absolutely please you hands down. It's a very solid gauge S/S. However, don't be disillusioned that stainless steel is so much easier to care for than conventional clay-fired porcelain. It will require constant cleaning to remove water spots and eventually you will see many scrapes and brush marks on the apron front from simply leaning against it. It's just inevitable so if you're looking for something that is hard as nails and will retain a flawless look then this is not the right material for you. Using a 3M polisher/sealant is recommended. Beautiful sink! This sink does retain water stains if you have hard water. (The manufacturer's e-mailed advice is wipe up the water after every use, so it doesn't stain the sink.) The bottom is flat, not slanted towards the drain, so food particles and garbage don't go down the drain easily. You have to pick up the rack and sweep them down. Sort of a drag. And lastly, because it's deep, you have to lean into and over it more than with a traditional sink that is not as big and deep. All that said the price is great and the sink is very nice looking. I had a contractor install it. This sink cost half of what other, similar sinks go for and is just beautiful. It was delivered in a heavy-duty box, no damage, and from what my plumber said, it was easy to install. It looks perfect in my 200 year old farmhouse, but adds a modern touch, especially when paired with my new faucet (also from Overstock). It came with a "pad" to prevent scratching and also with directions on keeping it clean. I have always wanted an apron front sink and love this modern, yet classic look. when we started our kitchen remodel I knew I wanted a farmhouse sink. So I ordered this sink first & it waited until I ordered cabinets, counter, & flooring. Gave the specs to cabinet company so they could plan height & depth accordingly so it was no problem for our pro-installers. Came together perfectly & looked beautiful! The awesome part of these sinks is the rack at the bottom & ability to wash large pots & serving platters. They don't sit in dirty water & If you get a pull-out faucet, you can wash & rinse so easily. Love this sink! Have had so many compliments & they're shocked at my bargain overstock price. Bring on holidays & parties! With this sink you are ready. Wow what a great buy! I was nervous at first to order such a large item online and I was a bit skeptical about the low price compared to other similar sinks I seen. 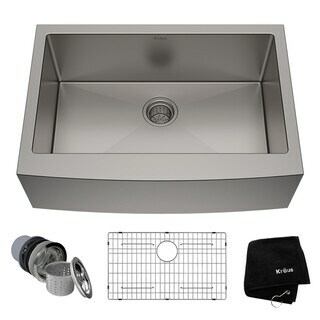 We are so glad we decided to order kraus sink from overstock. The quality of the sink is great; installation was no problem at all. The sink looks amazing in my kitchen and it's really quiet when the water is on. I'm very happy with this product and would highly recommend it. This is my first purchase with overstock, but now defiantly i will be back. We remodeled our kitchen and, like most people nowadays, wanted an apron sink. We chose stainless steel to be different from the usual ceramic or porcelain. Installed, the brushed finish is quite handsome and adds of bit of modern quality to the room. I am not sure how the soundproofing works, but there is a noticeable muffling to the sound of the water from our sprayer when it hits the sink. Also, the raised grate is amazing because it prevents dishes from sitting in gross sink water. The only reason I am giving it 4 stars instead of 5 is that it's more high maintenance than ceramic because water spots show up more on the side walls. Overall though, great buy. This sink you have to cut down your base cabinet to have it sit on. We decided it would be stronger if we just built a base ourselves. Worked out great. You really don't realize how beautiful this sink is until you put your countertop on and see the complete picture. We have the sink sticking out and the cabinet doors below look great. I have a very small kitchen (co-op) and everyone was telling me it wouldn't look right. It would make the kitchen look smaller. They were wrong.....it's perfect. A kitchen remodel that cost 2,500.00 looks like it cost double with this sink. Everyone asks me how much did you spend and when I tell them....they are shocked. This will be one purchase you won't regret.